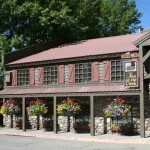 Inn on the Creek is not available for online booking. Please submit an inquiry or call our agents to get pricing and availability information. Swans Studio Suite- This suite includes accommodations such as french doors opening to the beauiful views of flat creek and te resident wildlife, a fireplace, and a fully equipped kitchen. This room can also be connected to a seperate 400 sq. ft. Master King bedroom wit a sitting area and seperate access to Flat Creek. 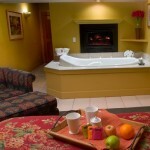 This would also include an extra Jacuzzi tub, and a double head walk-in shower. The combination of these two rooms equal 1,150 sq. ft. and can sleep up to 6 people. 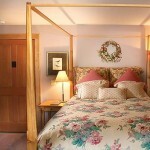 Creek Side Rooms- Each of these rooms feature a Queen bed, private bath, sitting/ reading area, and is 200-350 sq. 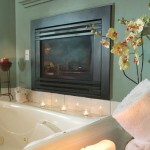 ft.
Jacuzzi Fireplace Rooms- These deluxe King and Queen bedrooms include a Jacuzzi tub, fireplace, sitting area, and is 350-450 sq. ft.
We require a 50% deposit upon booking. The remaining balance is due 30 days prior to arrival and will be automatically charged to your account. Cancellations made at least 30 days prior to arrival will be fully refunded. 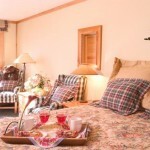 No cancellations fees at this Mom and Pop Inn! BUT, should you cancel within 30 days prior to arrival you're Up the Creek! 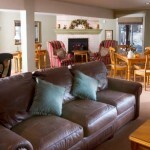 All monies will be forfeited unless we can resell the cancelled rooms at the full and/or discounted rates. All efforts will be made to resell cancelled rooms and your monies will be promptly refunded to you. Inn on the Creek is a non-smoking facility. 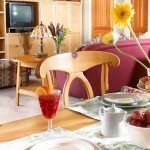 Room rates are based on double occupancy and include a full homemade breakfast. We charge $25 for each extra person. We are a pet friendly Inn. Arrangements must be made in advance on an individual basis to make sure your critter is compatible with our Inn. A $25 fee per day is added to your room rate. AT NO TIME CAN YOUR PET BE LEFT UNATTENDED IN YOUR ROOM! A maximum of two pets are welcome. In town earlier? By all means visit us and we will be happy to accommodate you should your room be ready. Otherwise feel free to use our facilities. Requested later checkout times can be honored if available.